Recorded in several spellings including de Aguirre, Aguirre, Agirre, Aguirrezabal and Aguirrezabala, this is an ancient medieval Spanish surname. 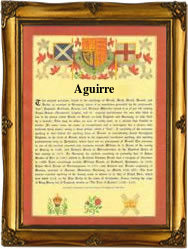 It is residential, and describes somebody who lived at either a place called Agirre, Aguirre, or Agir, or 'at the agir'. This word had a multiple meaning, and could describe a prominent place in a village, perhaps in the market place, or even a castle overlooking a town. In a sense the name is of Roman (Latin) origins, Spain being a province of Rome for many centuries. The spelling is also found in Daguerre, a village within the parish of Saint Martin de Seignaux, in France, and possibly in England, Agar Town, now forming part of the city of London. European records as distinct from British ones, are usually much later, but in a few cases, this surname being one of them, we have Spanish church recordings as early as any to be found in England. These include examples such as Lope de Aguirre, who married Beatris de Baltacar at Valadolid, on February 15th 1535, and slightly later, Juan de Suso de Aguirre, a witness at Forua, on coincidentally the same day, but in 1546. The surname is probably most associated with the province of Viscaya, and from the mid 16th century almost nine out of ten recordings are from this area. This is probably because of local church bureaucracy, rather than the nameholders suddenly moving, but 'movement' to avoid civil war or plague is always a strong possibility. Other recordings include Asencio Aguirre, christened at Forua on May 25th 1555, and Antonio de Aguirre, married at Gorlitz, Viscaya, on March 15th 1626.